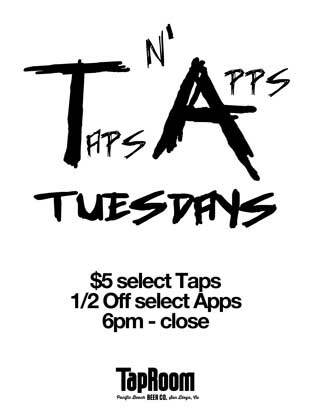 Taps and Apps for your PB Tuesday routine! Get your brunch on in PB! click here $2 off ALL Taps, Apps, Cocktails, Wines! The best Happy Hour in Pacific Beach! $3 OFF All 1/2LB Angus Beef Burgers All Day. Start your week off right with craft beer & a burger! 15% off All specialty bottles. Over 75 to choose from including Lambic Sours, Rare Barrel-Aged beers, & unique styles from around the world! Join us every Monday for Trivia with a local brewery host. Win prizes & score brewery swag all night long while you sip on Pliny the Elder or your favorite local beer. $5 Select Taps, 1/2 OFF Select APPS! Best Tuesday deal in PB! $2 OFF our featured cask beer of the week. Cask beer is unfiltered Ale that finishes fermentation in a metal cask & is served old-school style via a handpump, creating a truly unique “real” Ale drinking experience. All of our Wines bottles are 1/2 OFF! Bring some friends and enjoy a relaxing night with deeply discounted wine & food. 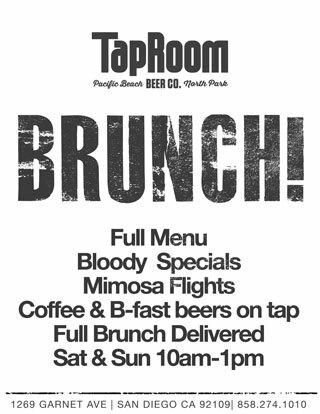 Full Brunch Menu ’til 2pm w/ drink specials including famous $6 Bloody Mary’s, Mimosas specials, & other unique offerings like Coffee Breakfast beer & cold-brewed coffee served on nitrogen! 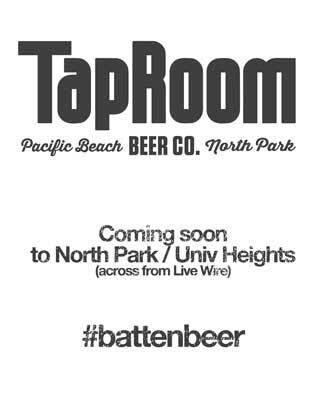 TapRoom is a top San Diego Craft Beer Bar & Restaurant established in 2006 in Pacific Beach, San Diego. With a focus on San Diego craft beer, awesome food & local hospitality, TapRoom is acclaimed as a local favorite and one of San Diego’s top craft beer bars & breweries. We offer a wide range of elevated food from pizza to burgers and tacos all available for dine-in or delivery. Our pizza delivery service is the best in PB and our large patio is great for large groups looking local for a great time. With lots of tv’s TapRoom is the place to catch a game or hang out with some friends. Welcome and enjoy, Cheers! We Deliver our full menu! No delivery charge!